Please let me know in the comments or in a mail if you liked this blog series. This will help me know whether I should make more like this or not. Definition: Including nearly everything possible. Everything imaginable. Welcome back to, Everything But The Kitchen Sink. 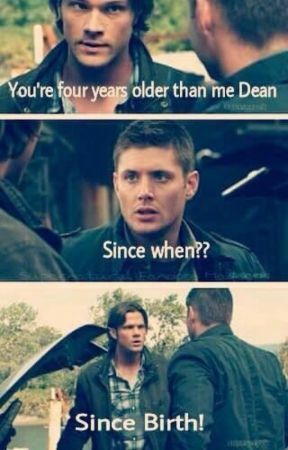 A blog series where I go and search the internet for all things Supernatural. Please let me know in the comments or in a mail if you liked this blog series. This will help me know whether I should make more like this or not. The quiz I selected for this edition of "Everything But The Kitchen Sink" is called "What Type of Supernatural Demon Are You". The challenge was to answer questions, in order to figure out which type of demon you became after going to hell. I had no idea what my results would be going in... but I had a feeling they were going to be interesting. My favorite part of the entire quiz was probably the fun gifs that went along with it. Although I was also a pretty big fan of the questions. I wouldn't have thought of most of them myself. My favorite question was about how you get revenge. As for my results.... I got a traditional black eyed demon. I was kinda dissapointed to be honest. I was hoping for something a bit more exciting. Oh well, tell me what you got in the comments. Want to see what's up on our fellow World of Supernaturalians' Instagram accounts yes. I invented that word? Well... first things first, my Instagram @joellezakos has been filled with long sappy paragraphs about how happy I am to have Theodore Rickhart on the Techie Team and how much fun it is to hang out with my friends Zoe Ashing and Allison Brooks. So if you want to see a big ball of fluff you can check that out. Taking a look at another Instagram belonging to @_jason.wright_ (AKA Jason Wright), I came face to face with... are those footie pajamas? The next Instagram I looked at belonged to none other than @jacqueline_cosette_hartley (AKA Jaqueline Hartley). Her Insta has the CUTEST selfies. Totally worth a look. It didn't take long for me to find another fun Instagram post. @amberkickasscolt (AKA Amberle Colt) posted the cutest image of herself all decked out to go hunting. Am I invited, Amb? This is where I got sidetracked for a little bit while looking at pictures of dinosaur earrings... hang on a minute XD. The next Instagram I found was @smythelila (AKA Lila Smythe). It appears to be a picture of her with a book on her head. To be honest, I think this should just replace hats from now on XD. If you want to feel any more single than you already do, you should totally check out the sappiness that is the most recent post on @eliza_mavros (AKA Eliza Mavros)'s Insta. For amazing Insta-Stories I totally recommend looking at @isaiahzelinsky (AKA Isaiah Zelinsky)'s Instagram. And for plenty of fun selfies @timonthythunderstruck (AKA Timothy Thunderstruck)'s account is always a great place to look. Because so many WoS peoplez are getting Instagrams I decided it would be a good idea to compile a list of "Who You Should Follow". If your name is not on this list, please let me know. I might not be following you myself! And If you don't have an Instagram yet, make one if you dare and post how we can find you in the comments. Thanks. Interested in writing blog posts like this one? Apply for the Techie Team today! We're now hiring! Contact Joelle Zakos with any questions or to apply. Chester Almonte This was amazing. Yes Robin, make oneee. The Darkness was released, demons and monsters run amok, and the apocalypse seems to return every few years. The only thing to do is band together, man and monster alike, to protect the world as we know and maintain a balance. Our Supernatural Universe will allow you to live life in a dangerous, demon-filled world, protected at the Nexus where hunters, Men of Letters, nephilim, witches, and beneficent creatures have come together for a common cause. Take classes, roleplay in chat and forums, and face the demon threat! We need you! SoMe Presents: The Easter Egg Hunt!